Lovely informative blog post about giving insects a helping hand by putting bug houses in your garden, and in tern preserving our precious planet. ‘With a cold snap on the way, it’s nice to give solitary bees and other useful insects a place to stay,’ I posted on my Facebook wall last Sunday with a photo of a pretty bug hotel I had bought in the afternoon at Westfield shopping centre. 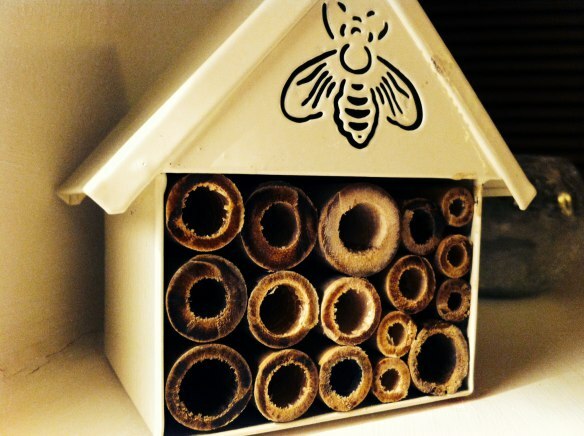 ‘Though I don’t yet have my own garden, hopefully it will find a quiet, undisturbed corner in a friend’s backyard.’ The post was inspired by a recent article on A french garden‘s blog, More on the mason bees, and proved popular with family and friends. I hoped they would be inspired to build bug hotels in their gardens.